Step 1 Make the syrup: Add the sugar, water, and cinnamon stick to a medium saucepan. Bring to a boil over high heat, stirring constantly until sugar dissolves completely. Add lemon juice and immediately remove from heat. Cover and let sit about 15 minutes to thicken, then remove cinnamon stick. Set aside for now. Step 2 Make the cashew filling: In the bowl of a food processor fitted with a blade, add the cashews, brown sugar, spices, salt and melted butter. Pulse until the mixture is finely ground (you should end up with something like a coarse paste). Step 3 Preheat oven to 350 degrees F.
Step 4 Assemble the Bakalava Rolls: Lay 3 sheets of fillo (phyllo) evenly on a clean work surface with the long side closest to you. Brush the top generously with the olive oil and melted butter mixture. With a sharp knife, cut the fillo into 4 equal strips. Now working with 1 strip, spoon about 1 1/2 tsp of the cashew filling in a straight line along the bottom edge that is closest to you (leave a little room on either side for the filling to expand). Roll tightly about 4 or 5 times away from you so that the filling is now encased into a fillo roll. Slice the first roll free. Place in a lightly oiled baking sheet. Step 5 Repeat the process to finish the first strip of fillo dough. Then repeat with the remaining strips. Step 6 Lay the next 3 sheets of fillo (phyllo) evenly on a clean work surface with the long side closest to you. Again, brush the top generously with the olive oil and melted butter mixture. With a sharp knife, cut the fillo into 4 equal strips. And repeat the filling and rolling process until you run out of dough. And of course assemble in your lightly oiled baking sheet. Step 7 When all the baklava rolls are assembled in the baking sheet, brush with more olive oil and melted butter. Step 8 Bake in the 350 degrees F heated-oven for 25 to 30 minutes or until the baklava rolls brown and crisp (you’re looking for a light gold brown, bottoms may be slightly more brown). Step 9 Remove from oven and dress with at least 1/2 the simple syrup (you can save the rest of the syrup for later use). Step 10 Let bakalva rolls cool completely before serving. 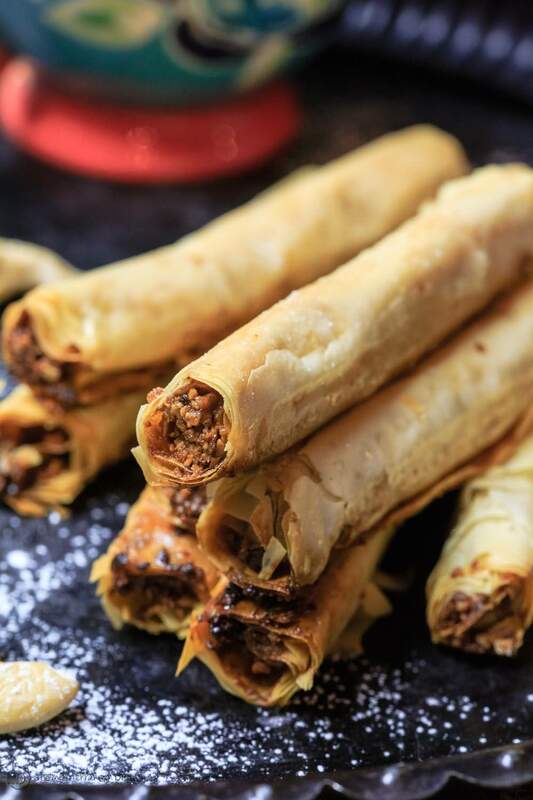 A fun take on baklava, these baklava rolls, filled with a spiced cashew mixture, make the perfect dessert for your next party! Be sure to see the easy step-by-step tutorial below the recipe.